Go more in depth to specific weaves as a community. I've started experimenting with Kristi. I should be able to work up a tutorial soon. I might be able to add some details about AR as well. Kristi tutorial has been submitted to the queue! It's my first tut on here, so please feel free to give me any critiques. Hehe, oops. I've submitted the edit to fix the typo. Thanks for the catch! Edit: After making and experimenting with Kristi, it is a hybrid between Half Persian 3 in 1 and Three Quarters Persian 6 in 1. I know that this probably isn't news to anyone, but I wanted to have the information posted on here for reference. Final edit completed. I double checked everything, it is now Kirsti throughout the entire article. I have completed the renders for Parallel Elf Berus, but I'm having trouble figuring out how to describe it. It follows a TE-AE (through the eye - around the eye) pattern like other weaves in the Persian family. All my attempts at Definitely Not Beer have lead me nowhere. Between no real description and a tiny, blurred picture at weird angles, I can't make heads or tails of this weave. After a brief search from the forums, this thread may assist with figuring out Definitely Not Beer. chao suggests that Persian Conduit uses it (multiple Definitely Not Beer connected to a Full Persian 6 in 1 chain). The pictures in Persian Conduit are a bit clearer. That being said, I'd place it closer to Lobster Tail with some of the rings going a different direction. On the same side, the four ring eye of each intersection have a TE ring, and a ring orbits that interaction. The orbital, is connected ”left” of the TE, through the Two rings on the outside of the four ring eye. I’ll see If I can make it in AR 6.2 or 8.5, tonight. Total Nerd: MScDS, Mailler, Gamer. Fluent in c++. A description, as in that it’s Two parallell 2-1 Chains, running through the central one, in a HP3-1 fashion, or as in the dren that is the ASE/TSE connections? Three different parts to the interaction. 2 Purple rings, like one grain in Box Chain. 1 green, for the other grain of Box. 1 Orange, for the orbital interaction. Stack Purple rings, in the same fasion you would use any precises rings, such as rubber, for box chain. Add a box chain wing (green), to one side, and one side only. 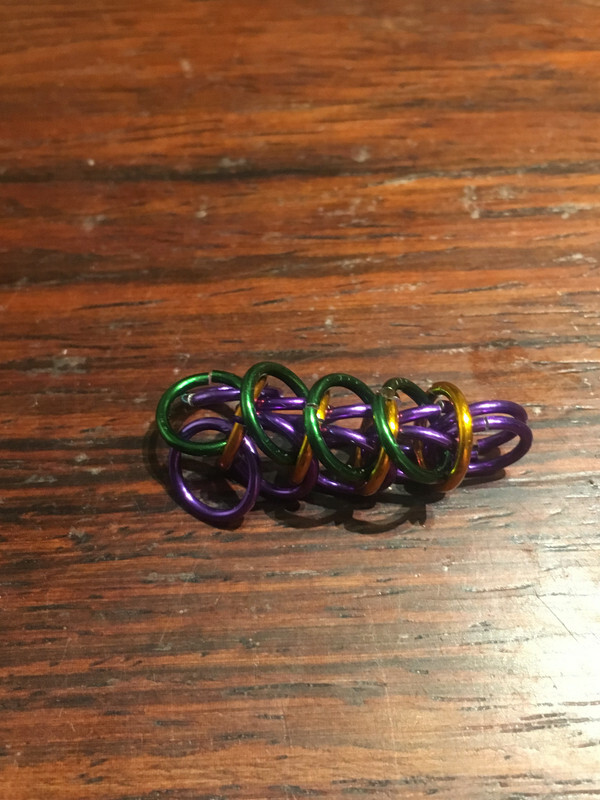 Add an orange ring to a Purple pair, and fold it down, so that it orbits the green ring next to it. The orbited green ring, should be the one through the eye, where the Purple rings the orange is connected to is the external pair. If you need a different angle or more info, just write. Much clearer sample for getting a view of the weave. If you haven't already, I'd recommend submitting it as a sample to the library. As you noted in the other thread, the orange rings are not exclusively held in place by an orbital interaction (there is a purple ring that goes through it). I have not submitted it yet, but Will, per your request. You are right, that I did not add that fact. Thanks! (Btw, for clarity, it’s 2 Purple). Seconded. In fact, I think we should work towards having two images of each weave, at least for the more complicated weaves: one with color-coded rings as a study object ("SO"? ), and at least one of the weave as a finished object ("FO"), as it would be displayed and/or sold. I really, really like your photo, Karpeth. It made it so much more clear in terms of what's going on in the weave.